If you're a fan on BoGD's Facebook, you might be aware that my already half-broken and ancient HP scanner finally fully broke over the weekend. I ordered a Canon CanoScan LiDE110 on Sunday and it arrived with lightening speed, so expect more cover scans! 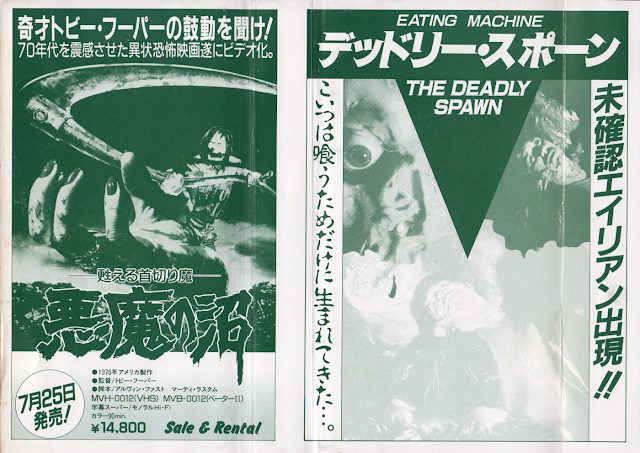 This Japanese glassbox of The Deadly Spawn (1983) popped into the mailbox yesterday. It's not a terribly scarce VHS, but the unfaded spine and intact "second" spine make this copy more desirable. The reverse advertises their glassbox of Tobe Hooper's Eaten Alive (1977). So the cover came like that so it could be opened up and those images are on the inside of it? I remember the old Anchor Bay slip-sleeves were like that (really cool), but this one is cardboard right? Strange. Kinda, it's a paper sleeve that lines the inside of a clear plastic case (or "glassbox") with the cassette sliding inside the cover inside the case.